Sometimes patients come to our office with really deep stains in the grooves and valleys of their teeth. It is really important to clean these out and make sure that there is not decay lurking underneath. Sometimes decay can get into these small areas and flourish with in the tooth. Fluoride is great to make the enamel really strong, however if there is small hole or defect, bacteria can get in there and cause decay. This is a great way to prevent needing to have a filling in the future! Sealants are a safe and painless way of protecting teeth from dental decay. A sealant is a protective plastic coating, which is applied to the biting surfaces of the back teeth. The sealants form a hard shield that keeps food and bacteria from getting into the tiny grooves in the teeth and causing decay. Sealants are only applied to the back teeth as these are the teeth that have the pits and fissures on their biting surfaces. Some teeth naturally form with deep grooves, and will need to be sealed, others with shallow ones, will not need sealing. The process is usually quick and straight forward, taking only a few minutes per tooth. 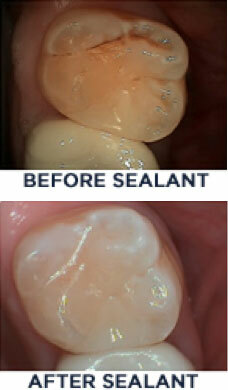 Sealants are totally pain free, and the teeth do not feel any different afterwards. Good oral hygiene is still an absolute necessity but the sealants reduce tooth decay and therefore reduce the number of fillings you or your child might need. Virginia Family Dental offers comprehensive dental care including sealants. For more information, call today at (218) 741-0405 to schedule a consultation with one of our dentists.